If you’re looking for a standard braid as backing for your reel, strand count may not matter. When fishing around shrubs or through thick lying reeds, it can make all the difference. Why is this so? For light to mid-strength applications up to 80 lb test, Tuf Line 4orce serves as a great example. It’s a specialty 4-carrier (strand) braid which results in a coarser weave. Tuf Line calls its 4-strand diamond weave aggressive, like the tread of a mud tire. Discover the details of 4orce braid, and why it cuts better than the smoother Tuf Line Domin8, in the following review. 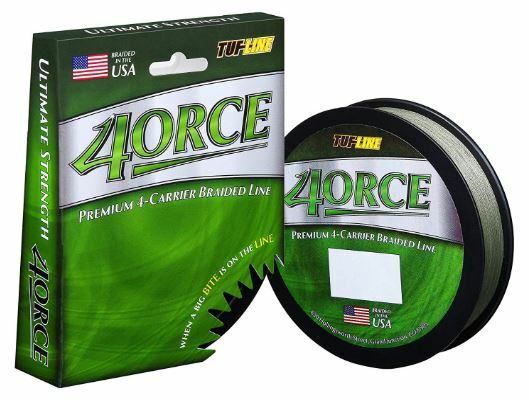 Product: Tuf Line 4orce Braided Fishing Line. Not only does 4orce 4-carrier braid have a more aggressive weave for cutting through cover, but it’s also thinner than the majority of braided fishing lines. With options in strength starting at 6 lb test and going as high as 80, anglers will get extra yardage using 4orce. In addition to being tough and thin, Tuf Line treats the finished braid with their proprietary coating, The coating bonds with the new Tuf Line Tuf-X fibers adding abrasion resistance and durability to the braid. Just like in their 8-carrier Domin8 label, Tuf Line employs their new Tuf-X fiber when manufacturing 4orce braided line. Using a diamond weave pattern, Tuf-X results in a braid with a profile that’s rounder and thinner. It improves resistance to abrasion as well as overall line strength. The secret is not out as to what the difference is between Tuf-X and other PE fiber but look for a future update with that info. 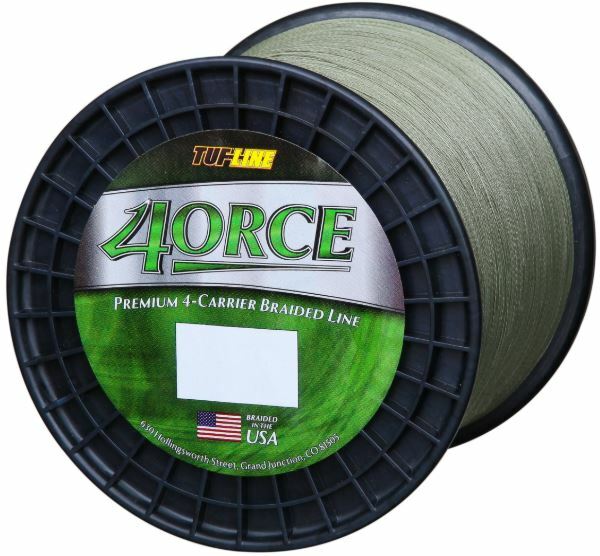 As they do with their Dominate and XP Braid, Tuf Line finishes 4orce with their proprietary resin coating. It glasses out the line for less friction when casting and adds another preventative measure against abrasion. Other benefits of the coating include a more manageable braid with some sense of body and longer lasting color. In their description of the 4orce label, Tuf Line makes an interesting observation. They liken the weave of different carrier braids to tire treads. It’s the perfect analogy for understanding how carrier count affects the weave, and how it can be useful. You’re not going to want smooth treaded tires if you know you’ll be 4-wheeling through the mud. Likewise, a smooth braid won’t help cut through kelp or reeds like the tough contour of 4orce. Tuf Line talks more about the differences between 4orce 4-carrier and Domin8 8-carrier braids in a side by side comparison. 4orce braided line gives anglers an edge in most waters that have heavy vegetation. Whether fishing freshwater largemouth bass near fronds or calicos in the coastal kelp line, a strong 4-carrier braid takes the beating. It has the ability to cut through weeds more efficiently than a smooth 8-strand weave. Features such as the Tuf Line coating enhance the performance and durability of 4orce, giving it a lift over braids like Daiwa Samurai. Daiwa x4 J Braid makes better competition but still lacks that resin coating. A braid like Power Pro Maxcuatro with its Enhanced Body Technology makes a better comparison to 4orce, though neither come cheap. 4orce won’t work for heavier uses due to its 80 LB maximum test. If casting distance is a prerogative, you’re better off going with a smoother 8-carrier braid. The weave has a less aggressive profile and flies off the rod with less friction. 8-carrier braids usually form the higher test lines for the simple fact that they have more strands. Large game fishermen often prefer to thread their leaders into the braid. You won’t have that ability with 4-carrier braids like 4orce. 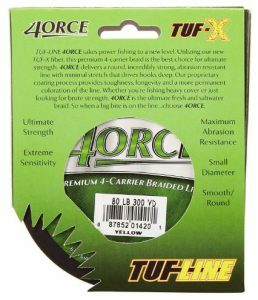 Tuf Line 4orce has the same desirable characteristics as all quality braids. It has virtually zero elasticity which makes the braid ultra-sensitive on the rod tip. You can drop down deep and still feel small bites. Of course, the big advantages of 4orce make it perfect for fishing around heavy vegetation. More often than with 8-strand braid, 4orce will rescue your prize yellowtail or lunker calico out of the kelp bed. Tuf Line braid comes with the confidence of years in the fishing line business. So much experience working side by side with anglers goes far for customer support. If you care to contact a representative, you’ll most likely be speaking to a fellow angler. Tuf Line provides contact info on their Website, which includes address, phone number, and an email comment form. You can follow their menu to knot tying videos or read testimony by their pro-staff. 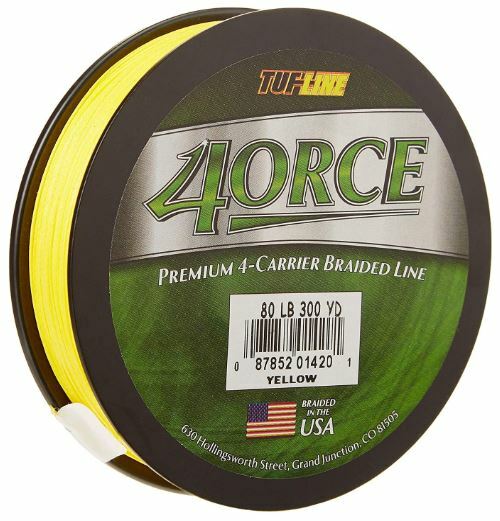 Tuf Line 4orce is a specialty braid and it’s not appropriate for all fishing situations. If you find yourself constantly battling weeds and having to re-tie your setup, it’s time to give 4orce a look. Its thin diameter, resin coating, and quality construction offer true value. Falling under the ninety percentile only because of its higher cost, 4orce Braid really is a force to be reckoned with. Please don’t hesitate to speak up about your personal experience with Tuf Line 4orce Braid. Our fellow angling readers will appreciate your advice. Or feel free to ask a question and FishtFight will be quick to respond. Thanks as always for reading and tight lines until next time.